Easy transit from the bridge to the bowdeck is a key feature found on the Silverton 43 Sport Bridge. 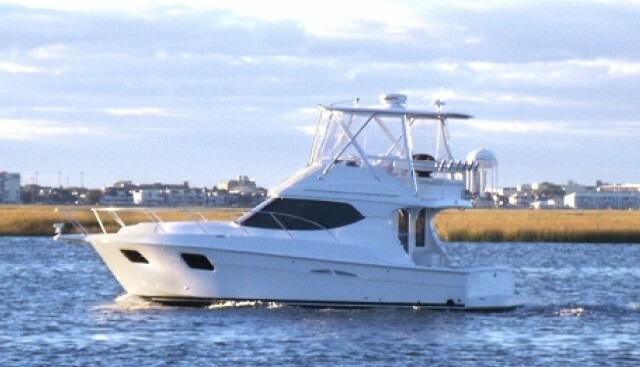 Anyone who’s spent time aboard a modern motoryacht know that getting from the cockpit to the bridge, and the bridge to the bow, can be a hassle. Scuttling along narrow side-decks, climbing ladders, and ducking through openings isn’t just inconvenient, but for physically challenged boaters, can be down-right dangerous. That’s why the chore is made easy with the “SideWalk,” on the Silverton 43 Sport Bridge. 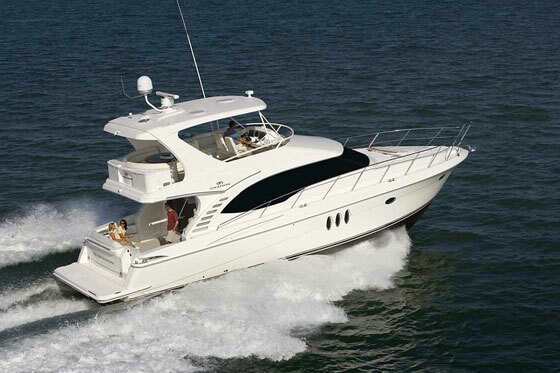 The Silverton 43 Sport Bridge is one motoryacht that makes getting around easy, from the stem to the stern. Ready to check it out? Let’s start off in the cockpit: there’s a stairway with handholds in the starboard side, making it easy to navigate up to the bridge. Now, you have a choice: turn left and walk to the helm, the forward settee next to it, or the aft settee behind it. Or, continue walking forward. Your path to easy access continues down the bridge to the foredeck, again via a stairway with good handholds all around. 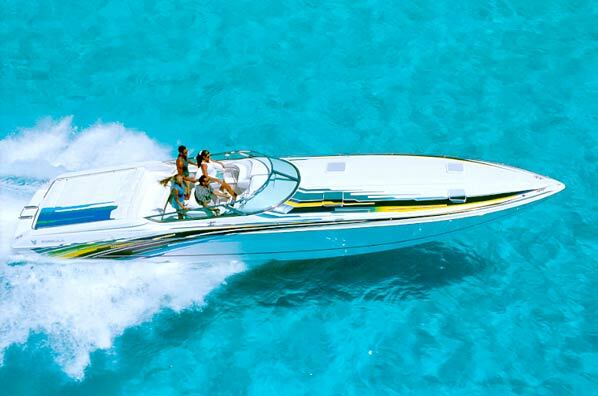 Once there, Silverton makes sure you’ll enjoy that foredeck by fitting it with tanning pads and cup-holders. Your comfort is similarly well-planned in the boat’s cabin. And with twin settees aft, a dinette forward to starboard, and a galley forward to port, there are several different spaces to be comfortable in. 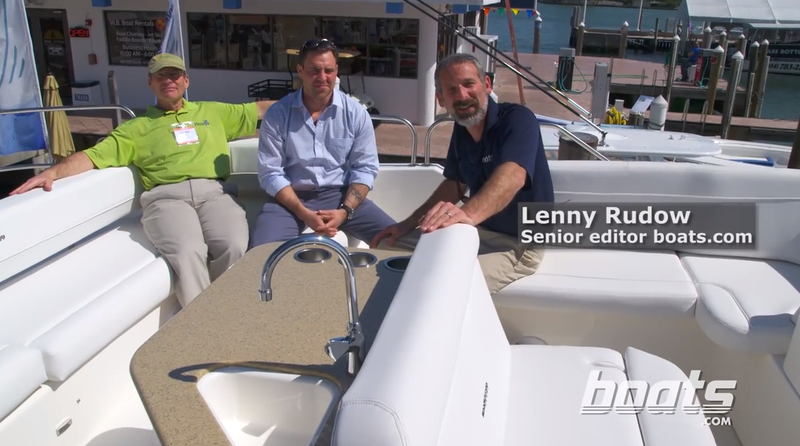 The dinette is on a slightly raised deck with another step up to the lower helm station—a perk that used to be common but is absent on many modern motor yachts, yet is considered a must-have by some off-season boaters in cooler climates. A high-gloss cherry finish gleams throughout the cabin, along with color-coordinated drapes and linens. 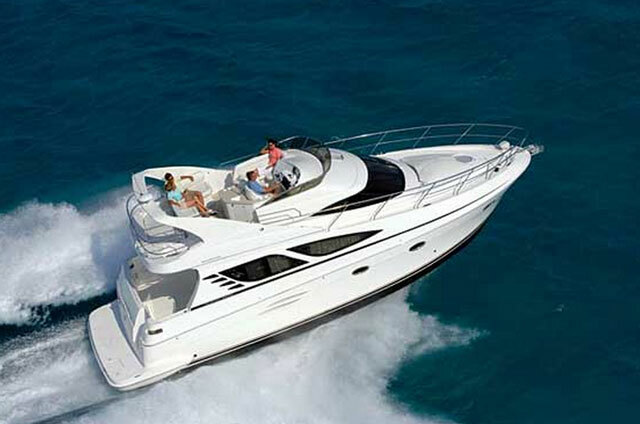 All of the other comfort-adding items you expect out of a motoryacht are present and accounted for. Three zone air-conditioning? Check. An entertainment center with a pop-up TV that rises out of the counter? Check again. UltraLeather upholstery? Naturally. 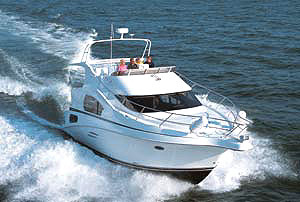 Unlike many modern motoryachts, the Silverton 43 can be operated from inside the cabin. Step below, and the master sits forward, with a pedestal queen berth and private head. The guest stateroom (with twins) sits aft and also has easy access to the day head and a shared shower. 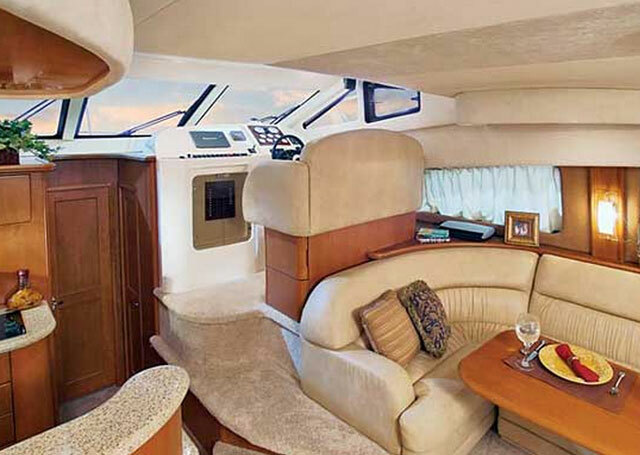 Some may consider the private sleeping accommodation a bit thin for a motoryacht of this size and nature (though a third couple can bed down in the saloon), but this “drawback” is also part of what will make the Silverton 43 Sport Bridge attractive to many outdoors lovers: copious space is dedicated to a large, open aft cockpit. Plenty of motoryachts have a tiny cockpit (or in some cases none at all) and instead utilize as much space as possible for the cabins. Fine. But if you want to have that outdoors area for evening cocktails, relaxing with a novel, or maybe even dropping a fishing line now and again, you’ll consider this use of space a significant advantage. And since the flybridge has an extended over-hang, that entire cockpit is protected. As usual, it all comes down to what you want out of your boat. And if easy access to all decks and levels along with plenty of useable outdoors area is what you’re looking for in a motoryacht, then the Silverton 43 Sport Bridge is headed straight for your short-list. 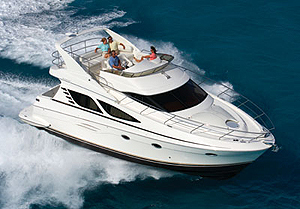 Other Choices: The Carver C40 offers a slightly smaller alternative, also with two staterooms, though side-deck navigation to the bow is necessary. 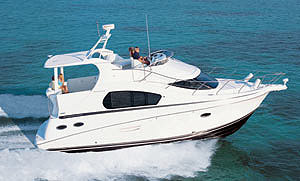 Another boat that may be of interest is the German-built Bavaria Virtess 420, which has a third private stateroom. See Silverton 43 Sport Bridge Listings. For more information, visit Silverton.